Welcome back from the weekend and Happy Monday! To kick things off, here’s a brand new chocolate chip cookie recipe. This is a half batch version based on a recipe by Lee Napoli, a well-loved Boston pastry chef who recently started her own chocolate shop in the South End. Here’s a link to the article which has some great pictures of Lee happily working with melted chocolate. It is also where you will find the full batch original recipe should you find yourself in need of more than 18 cookies. Update: Link doesn’t work anymore. The cookies are excellent and have what I think is an interesting taste and texture due to the extra egg yolk. They are puffy, but not cakey and fairly solid after cooling. Lee says that undercooking (7-9 minutes) will yield a chewier cookie. I might try making a few chewy ones later. Preheat oven to 375 degrees. Lightly grease cookie sheets or line with parchment paper. Melt the butter and pour into a large bowl. When the butter cools to slightly warm, add all three sugars (light brown, dark brown and granulated). Mix well. Beat in the egg and yolk. Mix together the flour, salt and baking soda, then add flour mixture to butter mixture and stir until blended. Stir in the vanilla and chopped chocolate or chips. Drop by rounded teaspoons onto prepared cookie sheets and bake until nicely browned, about 7 or 8 minutes. Lee notes that it’s always best to slightly underbake cookies so when they cool they remain chewy. Anna, I am “hooked” visit your site almost daily. You are an inspiration. I AM baking more. Your recipes and comments are NEAT. Made your One Bowl with Blueberries, ginger, white chocolate,oatmeal cookie recipe. GRAND. I am NOT using my old collection…I have started a white 3 ring binder with Anna’s Recipes. I am sure the Binder will be filled and used. Those look amazing!!!!!!!! i must try them!! Stephanie, that’s great! I was wondering how a little added molasses would work. A lot of people don’t have both light and dark brown sugar around the house, so a small bit of molasses might also be a good add-in for people who only have light. I baked some more of this cookie dough yesterday and found I liked the cookies better when baked for 12 minutes. Love this recipe! I made a full batch and love how wonderful they turned out. My kids have raved about these cookies, and so has the husband. I ran out of brown sugar, but added white sugar and a couple tablespoons of molasses. Anna, I’ll email you a pic, I don’t want to post it here, might put everyone off their cookies!!! Ah how I love a new chocolate chip cookie recipe. It’s just one of those things that I don’t mind trying over and over and over again!! Anna, I am so glad you tried the recipe, and more importantly that you liked them….I thought the recipe sounded good. I definitely will be making these soon. My husband is diabetic and I try not to tempt him too much. I do bake cookies for my friend’s 92-year old mother… She’s not very adventurous. She loves Snickerdoodles and other basic cookies. I recently made her the white chocolate chip you posted from Smitten Kitchen. I thought they were fabulous. Mine turned out exactly as described. I used good white chocolate (1 bar Lindt and 1 bar El Rey) and my best Fleur de Sel. She thought they were just OK. She suggested I might use Heath chips next time…Any thoughts? Yesterday, I made chocolate chip cookies from a recipe copied off of David Lebovitz’s website. It uses mesquite flour and some other unique ingredients. It is fabulous and tastes even better the second day. Michelle, do you have a picture of your cat??? I want to see Frankenkitty. Ellyn and Kerry, I am glad you both liked the cookies. Maybe they are even better with 1 T. vanilla! I saved some of the dough and am going to try to bake some larger ones. For larger ones, I’ll probably reduce the heat to 350 degrees F.
Great cookies! And I too put in the 1 T of vanilla. They were delicious! I have been reading your blog for a couple of years now and have never commented, but I wanted to say that I tried the chocolate chip cookie recipe today and it was excellent (and I did use 1 full Tablespoon of vanilla!!). I thought it may have been a typo, but wasn’t sure, so in it went (and they still turned out well!). I love that you scale down your recipes as well…I’m currently cooking for two so I don’t feel as guilty when I make a “half” batch from your blog! Thanks for an enjoyable daily read! Oh, I’ve made that CI recipe, I remember the extra egg yolk! They turned out quite nice. I’m game to try today’s recipe too, sounds good! Megan, it should be 1 1/2 teaspoons vanilla. I like vanilla, but not THAT much. Heidi, thanks for posting that one. I tried the CI recipe a long time ago, but forgot what I thought of it. Adding the extra egg yolk reminds me of my favorite chocolate chip cookie recipe, the Cook’s Illustrated Thick and Chewy Chocolate Chip Cookie. Have you tried those (recipe below)? If so, how do they compare? 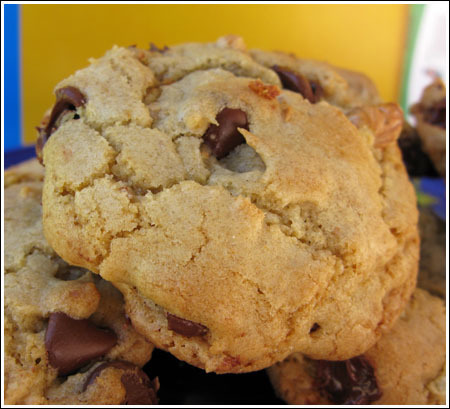 These truly chewy chocolate chip cookies are delicious served warm from the oven or cooled. To ensure a chewy texture, leave the cookies on the cookie sheet to cool. You can substitute white, milk chocolate, or peanut butter chips for the semi- or bittersweet chips called for in the recipe. In addition to chips, you can flavor the dough with one cup of nuts, raisins, or shredded coconut. I printed Lee’s recipe last week when someone blogged about the article she’s in. It’s on my list and looks good! I made some yummy spiced oatmeal raisin cookies today, pretty good! I’ve also made another ccc recipe I found from Canyon Ranch, it’s low fat and not quite what I wanted-very cakey. I only baked six cookies and since the dough is quite soft, I may just add banana, see what I think about the dough and bake them in mini muffin tins. We’ll see! Lee’s ccc’s look yummy–oh and so did your Black Forest cake from yesterday! I noticed that when you scaled down your recipe, you still left in the full tablespoon of vanilla. Do you like a stronger vanilla flavor, or was it a typo? The reason I am asking you this is because I made a batch of chocolate chip cookies and left out the vanilla – and I think they were almost better! Either I’ve got super sweet vanilla or I am crazy! YUM! I’m going to have to try these, as for some reason all my cookies have turned out flat flat flat lately. I even replaced my baking soda and baking powder, but saw no change. If THESE come out flat, I’ll know for sure there’s a problem! Yum! One can never have too many chocolate chip cookie recipes… or at least, I can’t. Puffy but not cakey sounds great.